At some point over the past five years, most of us have probably asked ourselves if we have the guts to take on a fixer-upper (I know you've seen at least one episode of that show!). My answer, at least in my imagination (and not if my husband is asking), is a resounding yes. I love a good before-and-after, and the idea of living in a house that I reimagined and designed to my specifications sounds exciting. That's what drew me to this old house in Concord, MA. The listing says it needs "a complete renovation." The outside is rather deceiving—it looks pretty perfect just the way it is, with the lavender-hued front door, stone walkway, and cute little fence, all of which look well-maintained and cared for. Then I scrolled through the interior photos, and sure enough, it's in need of some TLC. There are some really special details still intact, such as the millwork, the beamed ceilings, and the huge turned newel post. It remains a blank canvas, however, and just needs someone with a good imagination to breathe some life back into its walls. How would I freshen this place up if it were my fixer-upper? Let's take a look. I wouldn't change too much about the outside of the house. 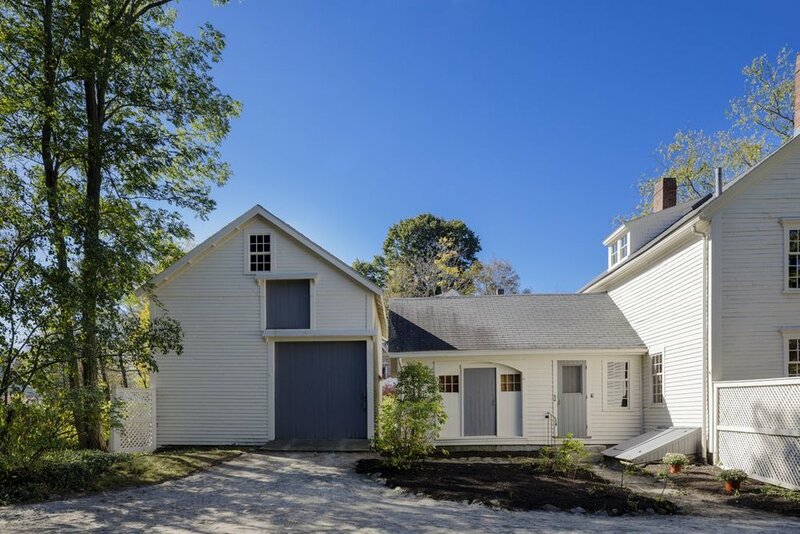 The simplicity of the side gabled roof and white clapboards speaks to the house's Shaker-style architecture, which focused on simplicity, neatness, and function. It was common for these houses not to have shutters. I think the lack of shutters actually increases the aesthetic appeal, so I wouldn't add any. That beautiful lavender color on the door would stay. What I would change about the house is the roof—a cedar shake roof, as shown in the top two photos below, would look incredible. I'd also spruce up the fence, give the house a new paint job in white, and add some minimal landscaping that wouldn't obscure the structure. The foyer and staircase show off the house's good bones. That turned newel post is such a fantastic detail. To make this area feel warm and welcoming, I'd freshen everything up with a warm white paint, install a runner on the stairs, put down area rugs in rich and vibrant colors, set up a console table with a lamp or two, and maybe even add a bench to create a small seating area. I'd also hang a mirror to reflect light and make the space appear brighter. The kitchen needs a total overhaul, but I would save the beams and work them into the new design. I'd love to see a combination of warm wood, white paint, and taupe or gray trim used in this space. I would keep the bones of the kitchen looking traditional in style, but I'd probably add a few contemporary touches here and there. Wood accents would play a big part in the design scheme, and a butcher block island countertop or wood-framed work table would make great accents. This next room is probably the dining room since it has built-in china hutches. How great are those window seats? I could see this room looking fabulous in high-gloss, peacock-green paint. 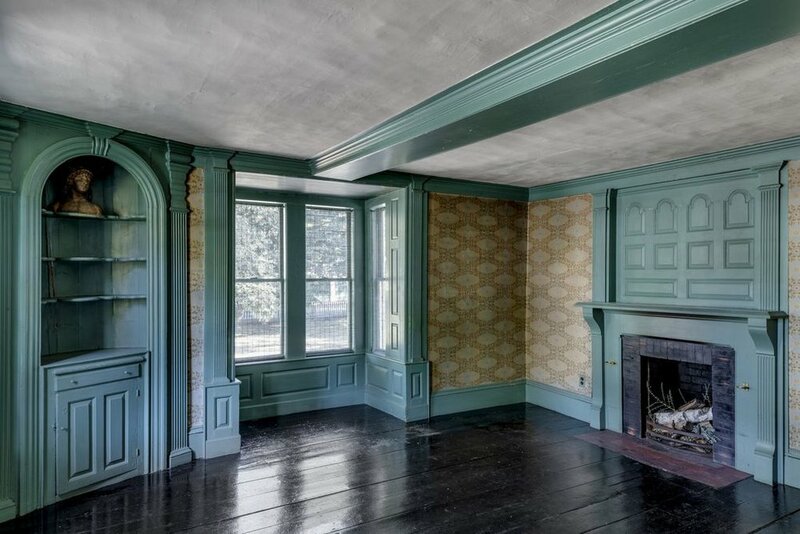 It would certainly feel cozy with dark paint, low ceilings, and a huge fireplace. But seeing as I've gone light and bright in other areas of the house, I would bring that look into this room and soften all those hard wooden edges with super plush cushions in the window seats, woven window shades, sconces or pendant lights, and a warm white color on the walls with a taupe or gray color on the millwork. 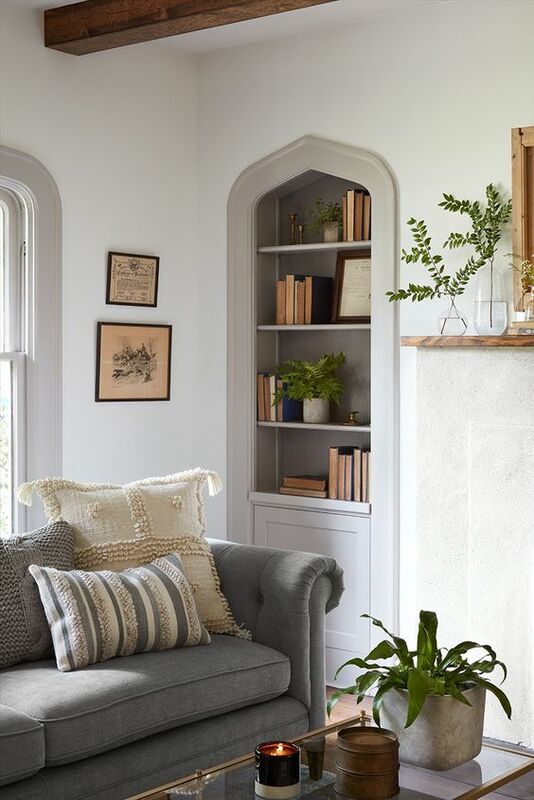 Light walls and a warm, gray trim color are in keeping with the traditional look but would make the space feel updated and on pace with today's trends. Traditional does not have to look dated! The interior architecture of this room provides a lot of woodwork to work around. I would consider adding more millwork to the space, as shown in the photo below. I would add some non-structural beams to the ceiling and build out the wall to include panels of painted woodwork in a soft taupe or gray. A cute dog is definitely the best finishing touch! This looks like a good-sized master bedroom with a straightforward layout that would be relatively easy to work with. I'd lighten everything up with fresh paint, add floor-length drapes on the windows, and layer lots of textured linens in soft blues, chocolate browns, and creamy whites. A soft wool rug underfoot would feel luxurious. Given the sloped ceilings, this room is most likely on the third floor of the house. 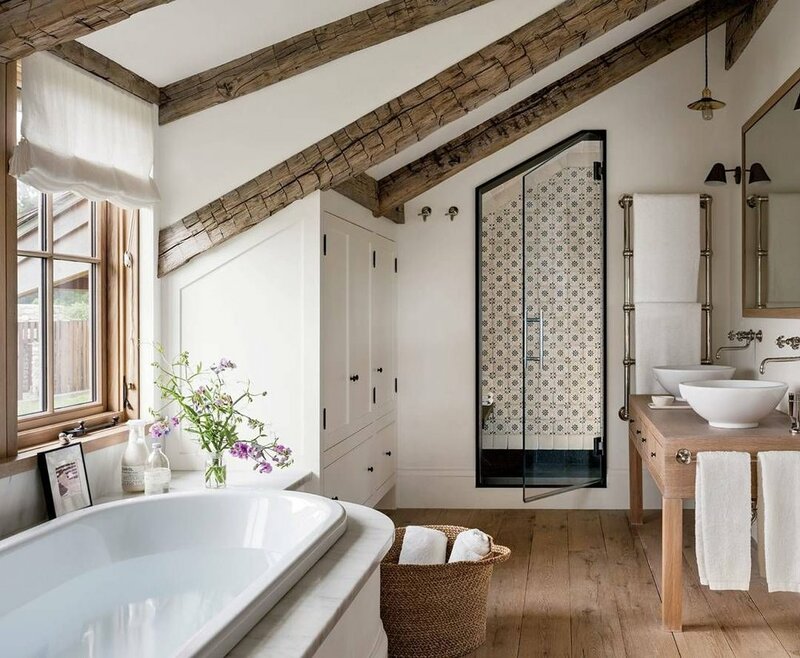 I could imagine transforming the space below into a light-filled bathroom that uses the sloped ceilings to its advantage. Ambitious? Perhaps. This space makes excellent use of the knee walls, though, and the chimney stack could most likely be camouflaged by being incorporated into the built-in storage. Here's another awkward little room with sloped ceilings. These spaces are always tricky to plan when you have low, slanted ceilings to contend with, as well as something like a brick chimney stack located in the middle of the floor. On the plus side, the chimney stack offers a unique architectural detail to work into the design. It's just too bad that it's in such a weird spot. I would try to work around it by creating a sleeping nook or daybed/reading nook in this area. Sleeping and reading are two activities that don't require much in the way of overhead clearance (unless you tend to sleep standing up or read while jumping on a trampoline). These cozy little corners make great use of this awkward space. Much like the front of the house, this exterior exposure is in pretty good shape. I'd insert more windows in the breezeway and gussy up the barn/garage structure. A trellis over the garage door would be a simple but stunning addition. Another lovely detail would be a brick or pea gravel walkway lined with some nicely-edged garden beds full of boxwoods or hydrangeas. Any fixer-upper requires a lot of work and a ton of decision-making. Having a vision for the finished product and knowing what you want is half the battle. I think I'm off to a pretty good start here! What would you change about this house? What details would you keep or add? 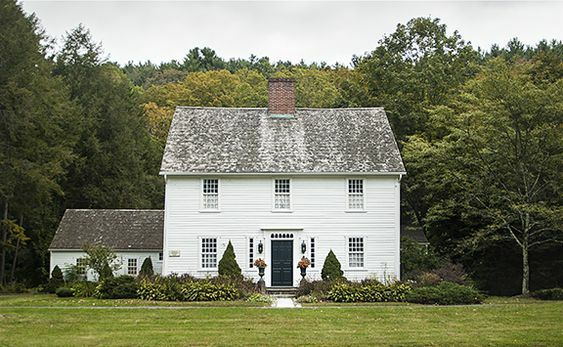 To learn more about this historic colonial house in Concord, MA, visit the listing page. All photos of the house are from the listing. Click through the inspiration photos for sources. 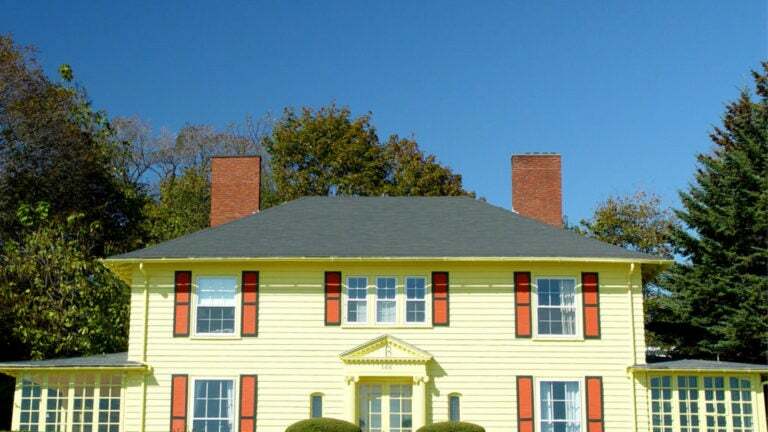 Did you know the sale price of a house that's painted yellow can be impacted by as much as a few thousand dollars? According to this article published on boston.com, yellow houses sell for $3,408 less than expected. This information comes from Zillow, which recently conducted its 2018 Paint Color Analysis. Another interesting tidbit from the study is the finding that houses with front doors painted black or gray (they specifically say "charcoal gray") sold for over $6,000 more than expected. I was slightly amused by that revelation. One of the first things I did when I moved into my current house was paint my front door a bright, sunshine yellow...and then I repainted it medium gray the following year, proudly telling my husband that I figured I just upped the value of our house by doing so. It wasn't the right color for me—but I do think it looks amazing on a lot of other house styles. Despite Zillow's report (and perhaps my own experience), yellow houses and doors continue to be popular. Country Living recently published a selection of yellow houses for sale around the country. Last fall, Boston Magazine rounded up five adorable yellow houses in the 'burbs that were for sale at the time. When John and Sherry painted their front door yellow, they received hundreds of comments from people telling them how much they loved the new color. And searching Google or Houzz for yellow front doors turns up thousands of results. One of the houses featured in Boston Magazine's article showcasing yellow houses for sale in the fall of 2017. Records on Zillow show the house sold for its asking price. So if yellow houses are so charming and easily marketable, what gives? The article didn't go into specifics, but it did say: "The analysis looked at more than 135,000 photos from homes sold via Zillow, from January to May, to see how paint colors may have affected sale prices on average, when compared to the company’s Zestimate. The analysis compared these homes with similar ones with white walls, according to a press release, and it controlled for other wall colors within each room type, square footage, home age, and ZIP code." If factors such as outdated interiors and a lack of square footage can't be blamed, then the message is simply that yellow is a less desirable house color. In certain circumstances, yellow probably is less desirable. Let's look at the stock photo used in the article (in which the house has yellow siding and red-orange shutters). It's extremely dated. Just looking at it makes me wonder how old the kitchen is and whether the bathrooms have been updated. The shutter color is influencing my opinion more than the yellow siding, although the overuse of yellow is problematic. 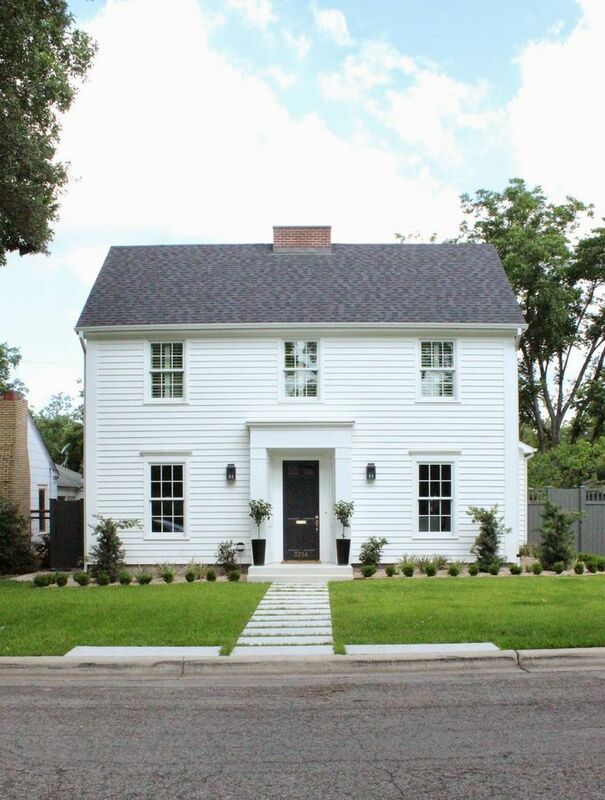 Imagine if the shutters were black, and imagine if all the trim around the windows, doors, and roof was white instead of yellow. It would go from drab to dreamy pretty quickly. In many other circumstances, as shown in the photos throughout this post, yellow houses exude a sense of beauty and romance that other colors can't quite accomplish. Context has a lot to do with it. Accent colors have a lot to do with it. The exact shade of yellow has a lot to do with it. The architecture matters, too. I can't say every yellow house is perfect—let's face it, the house equivalents of Dwight Schrute's mustard-colored button downs do exist. I'd love to see the photos of the yellow houses from Zillow's research that led them to this conclusion, wouldn't you?